RRSPs are a great place to put your nest egg, but as Bruce Sellery explains you need to give it regular attention if you want it to meet your retirement needs. What is the safest way to invest for retirement, with the best return, other than RRSPs? The RRSP needs a therapist. The poor thing needs someone to sit down with her and talk through her No. 1 source of angst: feeling misunderstood. She isn’t paranoid. As your question illustrates, she really is misunderstood. But don’t take it personally—millions of Canadians don’t give her the respect she deserves because they don’t understand what she is, or the power she has. To answer your question, I need to start there. The RRSP is not an investment in and of itself. It is a container for investments, like a knapsack is a container for your lunch. You can’t actually invest in an RRSP itself, but you can invest in things like mutual funds, stocks or bonds that go into an RRSP. So when you ask “what is the safest way to invest for retirement,” I’m going to answer what goes “into” the RRSP itself, because I believe that for most people the RRSP is the best container there is. You could choose another container for your retirement savings. For example, you could put your retirement savings into mutual funds in a Tax Free Savings Account, or a non-registered investment account. You could buy a stake in a business or even put actual cash into a very large piggybank. In some circumstances another container, other than an RRSP, may make sense. But for most the RRSP is the best container because it allows you to defer income tax on your contributions, and to grow your portfolio tax-free. When you withdraw the money you pay income tax on it, but it still works out in your favour because of the tax deferral and the magic of compounding. 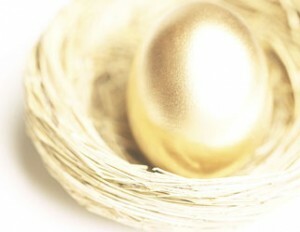 So, what should go “into” this great RRSP container? I would recommend four to six low cost mutual funds or exchange-traded funds (ETFs), available through your bank, investment adviser or online discount brokerage account. Why? These products provide diversification (“don’t put all your eggs in one basket”) and growth over time. Fixed income about equal to your age: If you’re 40 years old, you should have about 40% of your total portfolio in what’s called “fixed income.” That is because it is generally less risky than the stock market and behaves differently providing you with diversification. Limit your holdings to four to six different great funds: I have seen way too many “Value Village” portfolios—accounts with 20 different mutual funds of questionable quality. Some investment advisers will disagree vehemently with me on this, and my cynical side says that’s in part because they rely on selling the “flavour of the month mutual funds” to generate commissions. Make sure you understand the fees and commissions you are paying: You know how much that duck confit cost at the restaurant last night. It was pricey, but worth it. And there was enough for leftovers. But most investors have no idea how much their investments cost in fees and commissions. This is key because those costs can take a massive bite out of what you have left for retirement. Let’s say you saved $300 every month for 30 years and earned 7% on average over that period of time. You’d end up with $368,000. But if you had earned only 5% each year on that money because of the fees you paid you would have only $250,000. That is a difference of 47%!!! Or a whopping $118,000. Understand the relationship between risk and return: You asked for investments that were the safest and with the best return. There is a tradeoff between those two things. Super safe equals lower returns; less safe equals the potential for higher returns. You need to take some risk otherwise your money won’t keep up with inflation. I’m glad you’re thinking about retirement now. That will save you some money on visits to a therapist when you’re 70 years old and trying to work through your anger at yourself for not planning for the future. That is, if you could afford the therapist.